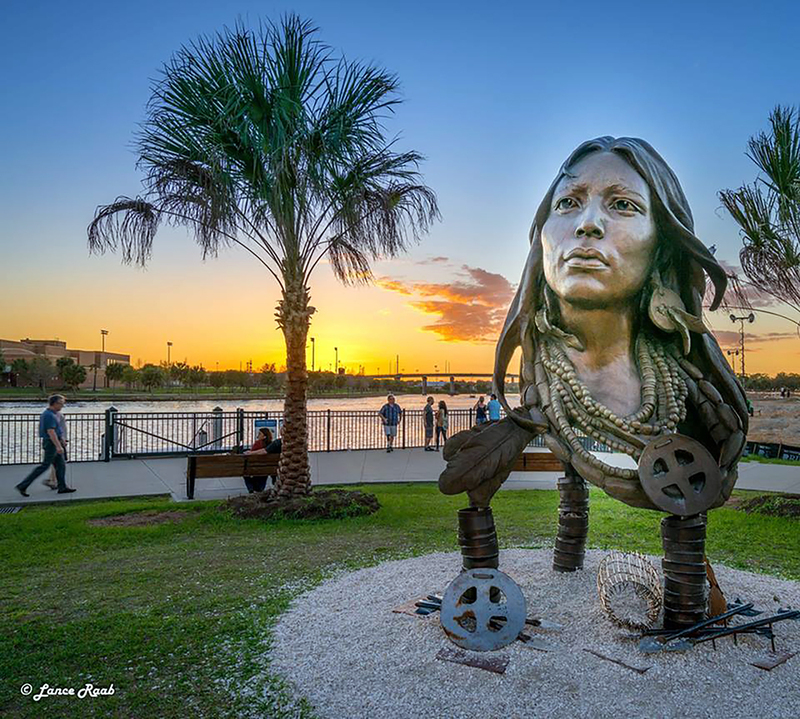 The 11-foot bust of a Native American princess was removed from the Tampa Riverwalk in Tampa Bay on Sept. 18 causing a bit of controversy. The massive 1,800-pound statue – “Ulele and the Lost Tribes” – had been on display for about a year, adjacent to the Ulele restaurant, located at 1810 N. Highland Ave. The location of the statue was what the city of Tampa Bay took issue with before ordering the removal. Tampa Mayor Bob Buckhorn wanted the bronze sculpture gone because it sat on city property, not the property of Ulele restaurant owner Richard Gonzmart. Bauman said the removal had nothing to do with what the statue represented. Ulele comes from Native American legend and was intended to celebrate Native American culture. 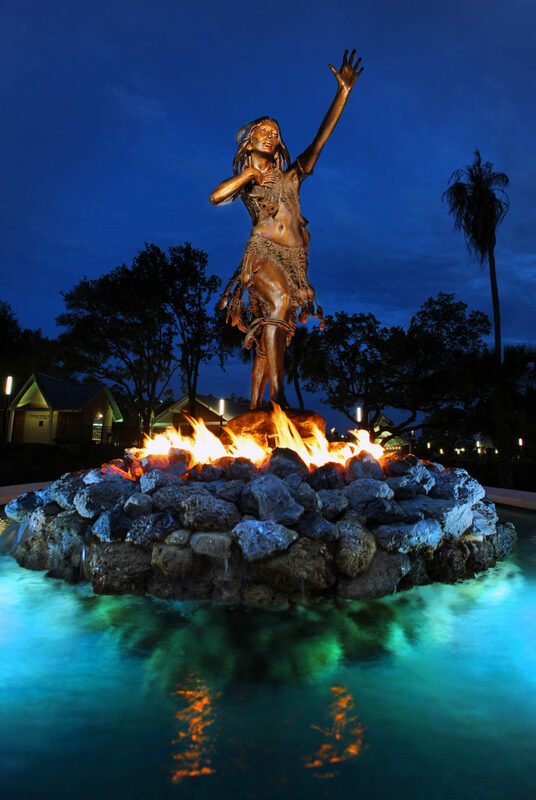 The Ulele restaurant is also named for the princess, who is believed to have lived in Florida in the 1500s. It had instantly become a popular spot for Riverwalk visitors to take a photo. Bauman said the city has a rigorous process for the approval of public art. Gonzmart owns the Columbia Restaurant Group, which operates a slew of eateries across Florida. He’s a fourth-generation operator of the original Columbia 1905 restaurant in Tampa’s historic Ybor City, a fixture for tourists and residents. “While we initially were disappointed that we had to move the bust that I had commissioned as a gift to the community, we feel confident that ‘The Lost Tribes’ eventually will return to public display on a site that the city will like,” Gonzmart said in a statement to The Seminole Tribune. The statue now sits in a warehouse in an undisclosed location due to insurance and security considerations, Gonzmart said. The work was commissioned by Gonzmart for sculptor Vala Ola of Cave Creek, Arizona. She and others were critical of the city’s decision and said it’s a slap in the face of Gonzmart and Native Americans. “Ulele walked along the rivers and shores of Tampa Bay and she belongs there,” Ola told The Seminole Tribune. “Their rich history and tradition adds a beautiful layer to this land. The land Uele’s monument was placed on was the land of her tribe,” she said. In addition to the bust, Ola created a statue of the princess walking through fire for Gonzmart. That statue is currently located on Gonzmart’s property at Ulele. When the bust was publicly dedicated last year, members of the Seminole Tribe of Florida, including medicine man Bobby Henry, were in attendance. Bauman said the city has a history of working with the Seminole Tribe, most recently on the cenotaph and ceremonial space at Cotanchobee Park. “We just recently restored the bronze plaques [at Cotanchobee Park]. The site looks pretty nice,” she said.